He’d be seated, dangerously but unconcernedly leaning too far back in his chair with his cowboy boots nonchalantly kicked up on the oversized desk, beckoning you inside loudly, with a notably Texan drawl. The walls were a mix of wood paneling and dark green and the overhead light, if there even was one, was never on, so despite the many windows, it was somewhat dark. Some of the Western saddles, spurs, and other related memorabilia Johnny collected were scattered around the office, though most of these were kept in his house, upstairs in the wondrous “cowboy room.” There was a gold Eclipse award on the shelf behind where he sat, from when Favorite Trick (sired by Walmac’s Phone Trick and in whom the farm had purchased stud rights in August of his juvenile season) became the first 2-year-old Horse of the Year since Secretariat. Somewhere was a photograph of Bailjumper, one of his prized, long-dead Longhorn bulls. There was too much to take in at any one time, but I always noted two items sharing the narrow wall space between Johnny’s main door and the door to his longtime administrative assistant Connie Martin’s adjoining office. One of them was a handwritten letter from John Gaines thanking Johnny for his not inconsequential role in making the Breeders’ Cup a reality–Johnny had used his charisma to convince his fellow industry leaders to get together and hammer out their differences–and the other was a homemade-looking embroidered square of fabric in a frame. “STAY IN THE BUGGY,” it read, with a buggy stitched into the design. Although he had many sayings, “Stay in the buggy” was Johnny’s go-to phrase, and it defined his attitude to life. He never gave up on himself or other people. Instead, he tried to always find a good side to every situation and every person, which made him a softie, too. Much to the frustration of his accountants, many of his decisions were not made with business in mind, but because someone down on his or her luck had walked into his office and fidgeted in one of the chairs facing his desk, explaining why they couldn’t pay a stud fee they owed or why they needed to breed their mare to a Walmac stallion well beyond their means. He usually wanted to help them, even if there was little chance they would be able to come through on their end of the bargain. They invariably drove their broken-down cars or pickups out of the front gate of Walmac with a foal share or discounted stud fee and payment plan, full of hope. That soft spot of his is also how Johnny gave a start to so many young, green people in the industry in whom he saw something. I was one of them, a kid from Puerto Rico who knew precious little about horses yet wrote a letter asking for a summer job at Walmac. I even offered to pay him for the work experience if he’d take me on. (And though I couldn’t believe it, he paid me.) 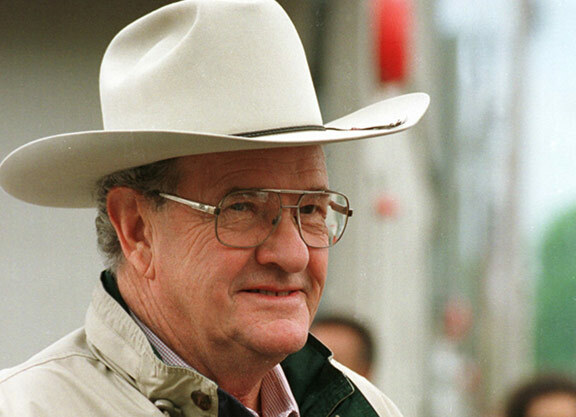 Others–and I’m sure there are many names I’m missing–who came up under Johnny include Four Star Sales’s Kerry Cauthen, British-based trainer David Lanigan, and bloodstock agents David Ingordo and Donato Lanni. If you asked Johnny what the “T.L.” of John T.L. Jones Jr. stood for, he was likely to answer “Tender Lovin'” or “Tough Luck.” And it was a guarantee that anyone who called the switchboard at Walmac asking for “John” and claiming to be a pal of his had never met him, because nobody who knew him even a little used that more formal name. His cowboy hat and boots weren’t for show; that was him through and through. There was nothing about him that wasn’t genuine. He was always just…Johnny, and whoever you were, he had a way of treating you simply and familiarly, without fancy words or putting on airs. Take his two-sentence speech at the graveside funeral service we held for the distinguished racehorse and sire Alleged, a colt who’d won two Prix de l’Arc de Triomphes and who was widely recognized as one of the all-time greats. Johnny’s words were plain and true: “We’ll kind of miss the old booger.” The handful of us in attendance nodded before he added, “He sure was mean.” Now everyone laughed, because we knew he was right in both respects. Johnny wasn’t the type to sugarcoat anything, not even for a eulogy, but his delivery always came with that Jones charm. At the Keeneland and Fasig-Tipton sales, he would (rather unconventionally) take a seat in a director’s chair to inspect the horses in his Walmac, and later Four Star, consignments, directing the showperson to turn the horse this way or that so he could see all the angles he wanted to see without having to get up, and he spoke to his friends John Magnier of Coolmore and Alec Head of Haras du Quesnay as easily as he did to those guys who’d bred a cheap mare on a foal share to Texas City because they couldn’t afford the thousand-dollar stud fee. And that was the good that was Johnny T.L. Jones. There was no situation that Johnny couldn’t fit into–or get out of, as required. He’d be the last person to say that he led his life perfectly, but he was a lovable rogue, and he could do anything from talk his way out of a speeding ticket to syndicate a $40-million stallion without missing a beat. And those of us who knew him were lucky that we around to pay attention to him. We’ll take the advice he dispensed so freely and “stay in the buggy” as best we can.